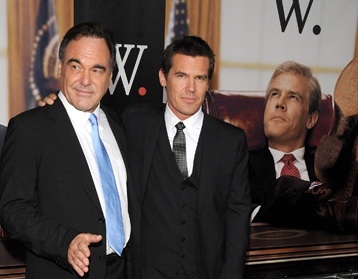 Jonathan Crocker » Blog Archive » Oliver Stone and Josh Brolin: W.
Navigation: Weblog / Blog article: Oliver Stone and Josh Brolin: W.
Josh, do you think Bush has seen your performance? Brolin: In all honesty, I can imagine him on his ranch and he slowly puts in the DVD, while eating pretzels… and hopefully choking! No, I know a few people at The White House and there’ve been a couple of comments about this movie. But they haven’t seen this movie yet, so the comments seem pretty hollow. Oliver, you famously went to college with Bush. How do you think he might have been different if he’d enlisted in the army like you? Stone: Oh, I really think it would have done him a world of good – if he had survived – to see the effects of war on the ground. When you walk through a landscape after a bombing, you understand the power of our technology. I think Bush would have benefited, I think the entire generation would have benefited, from the knowledge of war. We seem to have a love of war and a love of aggression, as well as money, in our country. Why did you leave 9/11 out of the film? Stone: Yeah, well 9/11 is a great moment; the pet goat story and so forth and his behaviour that day. But the movie is really a character study of a man who comes to fruition during, for us, post-9/11. The first act is about the recklessness of the man, the rebelliousness, the danger. The second act is the moderation of the man, the conversation of the man. And in the third act, you see him newly empowered. A newly confident George Bush. 9/11 has happened and he’s found a new role as a war president. You don’t think 9/11 was an important part of his story? Stone: I don’t think the formation of his character was over 9/11. I think that was a response he was waiting to have. He was angry way before that. He had been a failure compared to his father, all the way until he was 40. He was referred to constantly as the black sheep of the family. That’s a hard burden to live with. There’s lot of anger there and that anger was ready to come out. He wanted to be more forceful than his father. Why cast Josh Brolin as Bush? Stone: From my point of view, Josh is perfect. As much as he hates it, I thought of him as Bush when I knew him a little bit socially. He’s got a Western aura and kind of a cowboy feel. In movies, he’s played tough people, aggressive people, and that’s very American in some ways. He was offended when I offered him the role. ‘Me? Bush?’ But he was offered very lucrative roles after No Country For Old Men and he passed on them for this. Which was a tough call and I admire him deeply. So Josh, how did you feel being offered this role? Brolin: I was more confused than anything… First of all, I had played into this media-creative mythology that Oliver is this controversial figure and this leftist hammer. And it’s so not true. If you go back and look at his films, they’re extremely fair. He’s so sensitive about social issues. But him coming to me? I didn’t understand it at all. It wasn’t until I read the script and understood, ‘Wow, this is probably one of the most terrifying prospects for an actor,’ to follow someone through from 21-years-old to 58-years-old. It’s not easy. So then I went into massive fear and did as much research as I could do. Did you look at other people’s impressions of Bush to perfect your own? Brolin: Oliver showed me a YouTube clip of this comic called Frank Caliendo, who does the most genius impression of Bush. Genius, truly. Total transformation. How do you avoid simply creating a caricature instead of a character? Brolin: There are comedic aspects to this person that you can’t deny. You want those comedic aspects to be there but you can’t do it the whole time, because you can’t sustain that for two hours. Frank Caliendo’s great for about 15 seconds. Then you’re looking forward to the next impression. You try to find the human aspect of it – the human aspect of every scene. How much he adores his wife, for example. You both have famous fathers. Did that help? Brolin: I see the parallel; it’s an easy parallel. But I didn’t have to do exactly the same movies as my father did. This guy has to end up in exactly the same chair as his father, at exactly the same desk. I can’t imagine the weight of that. Especially when you have the emotional reactions to his father that he has. But it’s conjecture. You can only do your rendition of his life song. What did your family say when you took the role?